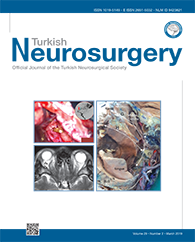 1The First Affiliated Hospital of Xiamen University, Department of Spine Surgery, Xiamen, Fujian, China DOI : 10.5137/1019-5149.JTN.20382-17.1 AIM: To determine the efficacy, safety, and clinical value of a novel surgical procedure involving the blunt perforation of the ligamentum flavum (LF) during endoscopic interlaminar lumbar discectomy. MATERIAL and METHODS: This was a prospective study of 50 patients (25 males, 17-51 years of age) undergoing lumbar discectomy for single segment L4/L5 or L5/S1 disc herniation. They were grouped into the control (cutting of the LF; n=22) and test (blunt perforation; n=28) groups. Intraoperative injury to the LF was evaluated by electrophysiological monitoring. The time required for perforation, total surgical time, and proportion of epidural sac and nerve root injury were assessed. RESULTS: Among the enrolled patients, 10% showed herniation of the L4/5 segment and 90% of the L5/S1 segment. The success rate for the perforation of LF was 93%. The intraoperative observation showed mild self-closing injury to the LF tissue. The test group showed shorter overall surgical time (43 vs. 56 minutes) and shorter duration to go through the LF (1 vs. 13 minutes, p<0.001). No dural sac or nerve root injury resulting from blunt perforation of the LF was observed.